We sell Comfrey a few different ways root cuttings, crowns, and plants. We do ship roots and crowns at this time. I am working on shipping plants soon! Comfrey is a large perennial herb, a member of the borage family, native to Europe, were it grows prolifically wild in damp places such as river banks. It has MANY uses for medicine, livestock food, or even an organic fertilizer in the garden. Crowns are 10.00 each – These are part of the plant when divided, and will usally have green sprouts out of the top. The green sprouts may die when planted but will grow back. These are your best bet if you are looking for comfrey ASAP. You can plant these spring summer and fall. Plants are 6.00 for small plants and 10.00 for the larger plants. I do not ship plants, I sell them locally only at this time. We do ship roots and crowns. We always add extras on shipped orders to help with shipping cost (we usually send more extras than the shipping cost). Shipping is usually only 6.00 in a small USPS flat rate box. We only ship in the USA. I ship on the day I dig them. We try to dig and send out on Mondays so you should receive your order on Wednesday. We take PayPal, checks and Money Orders. We sell Russian Comfrey, The Blocking 14 strain, All types of Russian Comfrey cultivars Bocking No. 1 through Bocking No. 21 are botanically known as Symphytum uplandicum or Symphytum uplandica. They all are a natural sterile hybrid, not a GMO! They spread by roots not seeds. In the 1950s the organic pioneer Lawrence Hills (founder of the organization now known as Garden Organic) developed a strain of Russian comfrey named Blocking 14 which is sterile and will therefore not seed itself all around the garden. To propagate it root cuttings, and crowns are taken. It easily roots and grows very quickly. Wherever you grow it don’t ever expect to eliminate it as its roots system is very hard to kill, and why would you want to kill this awesome plant! It is used for a livestock feed, So many uses in the Organic garden, and many other medicinal uses. Russian Comfrey is a sterile hybrid and will not be invasive like some of the other Comfreys. Comfrey’s deep tap roots mine the soil of nutrients, filling its leaves with minerals such as nitrogen, phosphorous and potassium, along with calcium and iron. Comfrey leaves contain more Nitrogen, Potassium, and Phosphorus than most homestead manures or garden compost. They have a low fiber content, so as they readily decompose they don’t rob the soil of nitrogen, when laid on the surface or dug in. A post and YOUTUBE videos from Rise and Shine Rabbitry will be out soon, on lots of comfrey information and the many uses on the homestead. More types of Comfrey will be available in the future. Comfrey is a sturdy adaptable plant that is able to withstand drought conditions thanks to its deep root tap. Each year, the plant will get larger with the root system growing denser. Because it is so adaptable to its conditions, a comfrey plant will survive for decades with regular watering and lots of sunlight. It will help to prune the leaves near the base of the plant this will promote blooming. Comfrey is a very fast grower, reaching heights up to 5 feet quickly. because it reaches this height so quickly, it requires a good amount of nitrogen. By mixing some type of organic matter, such as compost, bunny berries or green manure, in the soil this will give the plant plenty of nitrogen to thrive. If you are growing several comfrey plants, give the plants enough room to thrive. Space root cuttings or crowns about 3 feet apart when planting. When planting roots you can start them in pots or raised beds, when you see the sprouts you can plant them to the area you want. I plant them horizontally about 2 to 3 inches deep. Plant deeper in sandy soil and shallower in clay soil. 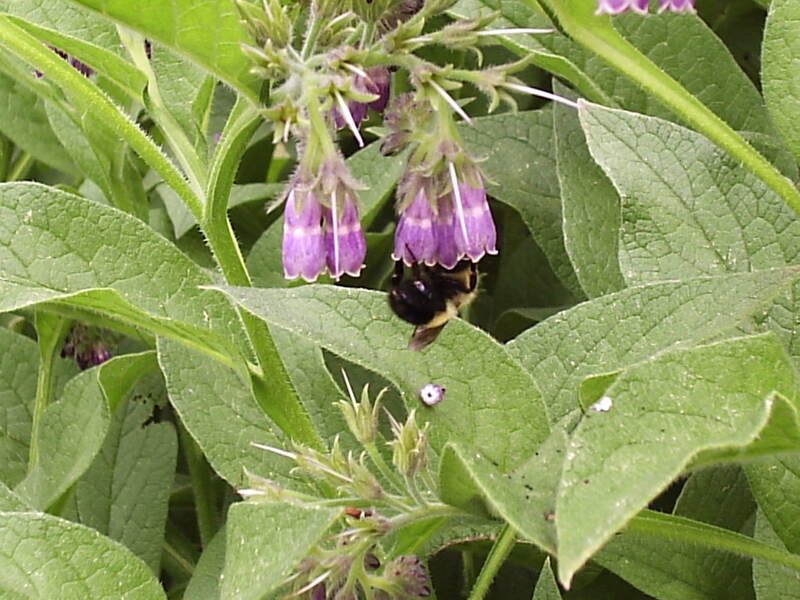 Comfrey has very few problems with pests or diseases. I would like to order some comfrey. 2 large roots and one crown. I see your pricing form the past. Is that the current pricing? $5ea. for the lg. roots and $10ea. for the crowns? If it spreads by roots, will it spread if it the bed is enclosed by a fame, such as raised beds? Yes the prices will be the same, have had the same price for 12 years and hope to keep it the same for 12 more. It will grow in raised beds as long as the bottom is open. Comfrey roots grow deep and thats how it gets it nutrients’ being a dynamic accumulator plant. We still have a few feet of snow on the ground will have a better time line for availability mid April. Hope to hear from you then. Thanks, I will be in touch. The question is will the comfrey spread out of its borders in a raised bed situation?